We thank you for your patience over the last few weeks while we've been out on the road, enjoying (and catching up from) Big Trip 2006, which you'll see in great detail here on Tower Site of the Week beginning later this winter. This week, we kick off a brand-new season of sites that have never before been seen on Tower Site of the Week - and we'll start with another one of the sites featured in Tower Site Calendar 2007. This week, it's our June photo - the four-tower array of WGRB (1390 Chicago), at 87th Street and Kedzie Avenue, on Chicago's South Side. There's some fascinating history here - not so much in the towers themselves, which went up in the forties for what was then WGES, allowing it to increase power to 5 kW DA-2, as in the stations that now use this site. On 1390, WGRB is just the latest in a long series of calls for this facility. WGES gave way to WYNR and then WNUS when the legendary Gordon McLendon bought the station in 1962, trying top-40 for a brief period, then "rip-and-read" all-news (hence the "W-News" calls), and then flipping to easy listening when the much larger WBBM went all-news itself in 1968. In 1975, the owners of WVON (1450), the market's heritage black station, bought 1390 and moved the WVON calls and programming down the dial to the much bigger 5 kW signal. The calls didn't last long, though - in 1983, 1390 became WGCI(AM), sharing the calls with its FM sister at 107.5, which was by then much more successful than the AM side. 1390 flipped from black oldies ("dusties") to black gospel a few years ago, and in 2004, right around the time I took this picture, the AM calls changed again, to WGRB. But the WVON calls didn't die in 1983 - in fact, they went right back to 1450, albeit as half of a new share-time license that was created when WVON moved from 1450 to 1390 in 1978. The FCC had handed 1450 to classical WFMT for interim operation for a few months while it took new applications for 1450, and in 1979 the new operators took over. Ethnic WCEV had (and still has) 1450 from 1-10 PM daily, while several personalities from the old WVON (most notably Pervis Spann) formed Midway Broadcasting and put WXOL on 1450 during the remaining hours. And when the 1390 incarnation of WVON became WGCI, Spann's WXOL on 1450 reclaimed the WVON calls. 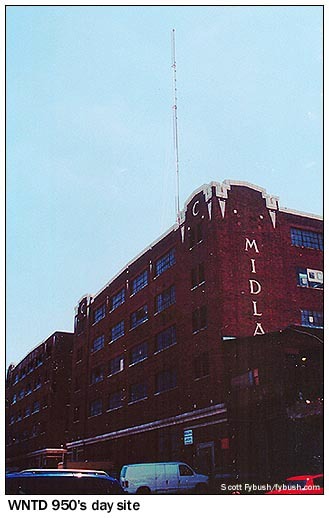 The second occupant of this site arrived in September 2003, when Clear Channel (which by then owned 1390) moved WHTE (1690) some 300 miles north from Johnston City, Illinois, at the southern end of the state, where it was a brand-new expanded-band sister to WDDD (810 Johnston City). With a new city of license of Berwyn, 1690 became WRLL, "Real Oldies 1690," bringing Larry Lujack and Tommy Edwards, among others, back to the Windy City airwaves. There are two more Chicagoland AM sites in our photo archives that haven't yet been properly documented as Tower Sites of the Week. In 1967, WAAF gave way to WGRT, "Great Radio," which in turn ended up in the hands of the Johnson Publishing Company (Ebony, Jet), which renamed it WJPC. In 1994, WJPC took the calls of its FM simulcast sister, WEJM-FM (106.3 Lansing IL), as "Jammin' 106," and in 1997, it was sold off and became the flagship of One-on-One Sports, under new calls WIDB. The calls changed again in 1999, to the present WNTD, and not long afterward, it was sold to Multicultural Broadcasting. WNTD was briefly a charter Air America affiliate in 2004, but that didn't last long, and it quickly reverted to leased-time ethnic, which it's still doing today. This site (above) at 16th and Western, within sight of downtown Chicago, is used only for 950's 1 kW daytime signal; there's a separate six-tower site, not shown here, that's way down south in Burnham, Illinois and is used only for the 5 kW nighttime signal, with a tight lobe aimed directly north into Chicago. We'll close with one more Chicago picture from our archives, also from one of our 2003-2004 trips to the Windy City. This one is the newest AM station licensed to Chicago, signing on in 1989 from this nine-tower site at 103rd St. and Woodlawn Avenue on the far South Side, just off I-94. 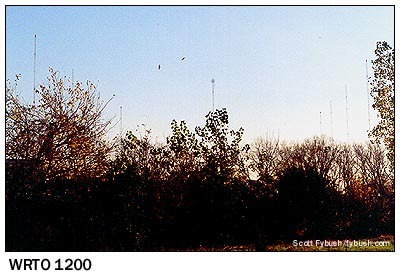 When it signed on at 1200 kHz (with 10 kW days from the middle tower and three of the in-line towers, and 1 kW nights from all eight of the in-line towers), it used the calls WOPA, which had a long history on 1490 and 102.7 in Oak Park, now WPNA and WVAZ, respectively. In 1995, it became WLXX, and when we got there in 2003 it had just gone through two calls in quick succession, first WVIV ("Viva," now on 103.1 Highland Park) and then WRTO, which is the current set of calls to go with the "La Tremenda" talk format that migrated there from WIND (560) a few years back. WRTO has a construction permit to move to a new six-tower site on 127th Street in the Blue Island area, from which it will run 20 kW days/4.5 kW nights, so this site may pass into Chicago radio history soon enough. The Tower Site Calendar 2007 is here! 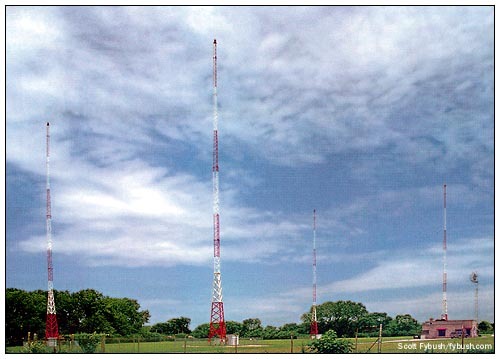 It's not just WGRB/WVON - but a dozen more great photos of transmitter sites near and far. Be one of the first to receive your copy - order today at the Fybush.com Store!